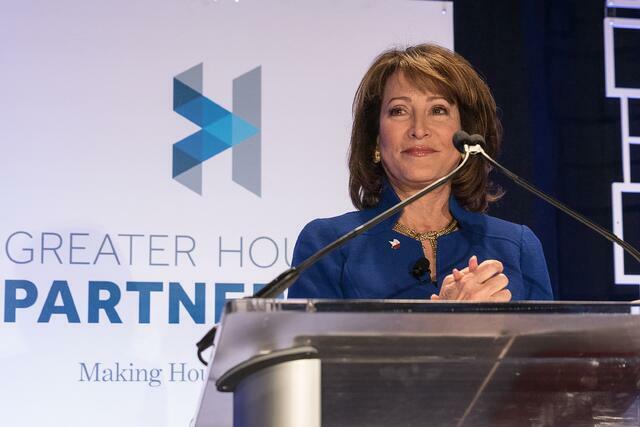 Port Houston Chairman Janiece Longoria provided a “State of the Port” address at the Greater Houston Partnership’s luncheon Nov. 16. Longoria gave a presentation highlighting the Houston Ship Channel and its impacts from Hurricane Harvey as well as discussed its continued importance to the economy in a fireside chat conversation with Enterprise Products’ CEO and President, Jim Teague. “Our ship channel industry immediately banded together to navigate through uncharted waters, and to restart this economic engine, put people back to work and get commerce flowing,” Longoria said about the major flooding event that occurred in August. The Houston Ship Channel supports the largest petrochemical complex in the nation and is critical to the country’s energy and economic security. The Houston Ship Channel remains the busiest and productive U.S. waterway, hosting more than 9,000 vessel calls and 200,000 barge movements. “As the local sponsor of the Houston Ship Channel, we are constantly working with the U.S. Army Corps of Engineers to improve the channel that serves more than 150 public and private facilities, supporting $265 billion of economic activity annually,” added Longoria. The Chairman also reported that Port Houston’s eight public terminals, which provide diverse cargo opportunities, handle 20 percent of the overall tonnage of the greater Port of Houston. Enterprise Products has the largest ethane export facility in the world, located at Morgan’s Point. The event was held at the Royal Sonesta Hotel in the Houston Galleria.